Are the Monster DNA Pro the headphones for you? Monster makes some of the best headphones around, but it's never opted for the most subtle designs. The Monster DNA Pro are in keeping with the company's brash approach, but have a sleeker feel than some previous models. 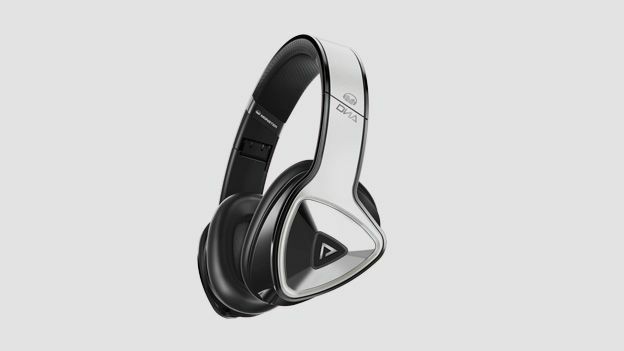 At £250, they're somewhere around the upper middle of the consumer on-ear field. They're not short of competition, taking on the likes of the Bose Quiet Comfort 3, Parrot Zik, and B&W P7. But can they mix it with the best of them? Let's find out. The Monster DNA Pro certainly feel like a premium pair of cans. As we said, subtlety isn't exactly Monster's hallmark, and these cans are pretty chunky. But the earcups now have a triangular casing that makes them look a lot more sleek. The design might divide opinion, but we're fans. They certainly look a lot more fashionable than the Beats Executive, or Beats Pro. They're very well built, and will withstand a few knocks. They also fold up, so will fit easily in a bag without getting caught on anything. Even the carry case they come with feels suitably luxurious. While the cheaper Monster DNA on-ear headphones come in a range of colours (some pretty lurid), the DNA Pro come in the more subdued matte black, or tuxedo white (which is the pair we tested). The Monster DNA Pro have plenty of cushioning. The earcups are clad in 'pillow-soft noise isolating cushions' – basically a synthetic material that's very soft to the touch. They did make our ears a bit hot after prolonged listening though. It's a bugbear of most cans, we find. It's not too bad at this time of year, but it's something to be aware of come summer. The headband does press down a bit as well, even if you extend it, and this can get uncomfortable after a while. With hard plastic on the outside, this pair is very durable, so you don't have to worry about dropping them. The headband has enough give in it to fit the biggest of heads, while still feeling sturdy enough to last a good few years. The cable is also non-tangle, which is a real plus. Sound quality is excellent, as you'd expect for this price. The mid-range has plenty of kick, treble is clear, and the bass packs some oompf, though not as much as we'd expect, given how chunky they are. The Monster DNA Pro don't have Bluetooth – you'll have to shell out around £100 extra for the Monster DNA Pro Wireless for that, when they launch at the end of the year – but they do have a couple of cool features. They're noise isolating, which isn't as effective as noise canceling tech, but the upside is they don't need batteries. They do a decent job of blocking out background noise. You'll know when you walk past someone drilling into the pavement, but they're fine for everyday city noise. You can also share your music with another headphone wearer. The Monster DNA Pro have two ports, so you can daisy chain another pair of headphones off them. You won't use it every day, but it's nice to have. The Monster DNA Pro double as a handsfree kit too, as a second cable with controls comes bundled in the box. The Monster DNA Pro are a well-made pair of cans with very good sound quality. We're fans of the angular design too. The B&W P3 and Sennheiser HD558 might pack a little more bang for your buck, but the Monster DNA Pro are a sturdy pair that are well worth considering.